With iOS 7’s release, there’s been a rash of app redesigns going around. The latest to get a celebrity makeover is Tapbots’s Tweetbot, one of the most prominent Twitter clients for Apple’s mobile platform. The new version, Tweetbot 3, has been released as an entirely separate app for the iPhone—meaning a new price tag for existing users and new customers alike. Of course, among the most distinctive things about the old Tweetbot was its user interface style: Despite doing its own thing, it built on the look of iOS 6 and its predecessors. But in the new world of iOS 7’s design aesthetic, it’s clear that Tweetbot was in need of a change, and Tweetbot 3 brings a thorough re-envisioning of the app. 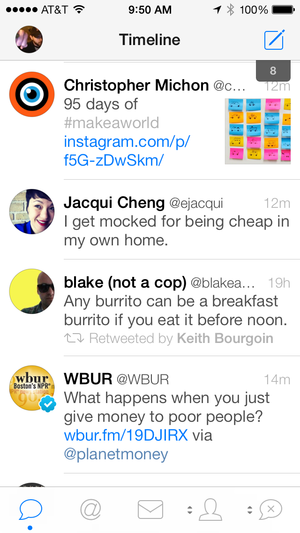 The new Tweetbot takes it cues from iOS 7, with rounded images and a mostly monochromatic interface. Whereas the old Tweetbot looked as though it might have been constructed from shiny polycarbonate plastic—the kind of material that makes up the back of the iPhone 5c, for example—the new version seems as though it would more likely be sketched with pencil on paper. The most obvious change is the color scheme—in place of the dark grays and dark blues of the old Tweetbot is a largely monochromatic interface of the kind that you’ll see in Apple’s own iOS 7 apps: large amounts of white, black, and gray, with the occasional blue as a highlight color. Like the rest of iOS 7, it’s sleek and minimalist, without extraneous ornamentation. Even so, longtime users of Tweetbot—who may at first blush wonder what happened to their favorite client—will quickly realize that beneath the new exterior is the same app they’ve used and loved. The bottom toolbar retains its configurable options for the last two icons; you can still swipe on tweets to view their details; even the familiar bird-with-a-loudspeaker-beak app icon is present, albeit with a somewhat “flatter” look. Your drafts now hide under a page-curl that animates when you open the compose window. There are new features here, too. Tweetbot 3 can take advantage of iOS 7’s improved multitasking to offer background refreshing, keeping your timeline up to date even when the app isn’t open. A new interface for drafts shows up as a pseudo page curl when you’re composing a tweet, displaying how many unsent tweets you’ve composed; it cleverly folds back out of view when you start typing a tweet. 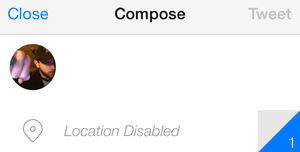 However, some settings and options didn’t make the jump to the new version. There’s no longer a user-configurable triple-tap option, you can’t adjust the font size without changing it systemwide, and swiping left-to-right no longer shows the Conversation view. There’s also been some tweaks to the way lists work. Tapbots has provided an extensive FAQ fielding the most common queries about Tweetbot 3, as well as providing some information about what’s coming down the road. Perhaps the biggest disappointment with the new version of Tweetbot is that the $5 app (as of this writing on sale for $3) is only for the iPhone. An iPad version is on the way, but will likely be a separate version requiring another purchase. Still, that delay may be a smart move by Tapbots: Those who get accustomed to using the new Tweetbot on their iPhone may find themselves all too ready to pick up the updated iPad version when it’s finally available.